The Honeywell F300E1027 is a complete system that includes the cabinet with the power box and 120v cord, access door, two electronic cells, two pre-filters and two post-filters. Ready to connect your duct and plug in. The Honeywell F300 maintains peak air cleaner efficiency over a wide range of cell dirt loading conditions through the use of a self regulating dual voltage high frequency power supply. The dual voltage increases particle charging efficiency with a high 8150v ionizing wire voltage and increases collection surface area through a reduced 4280v plate voltage. The dual voltage is a feature exclusive to Honeywell. Also exclusive to the F300E1027 is a very sensitive differential pressure sensor making the Honeywell compatible with slow variable speed air handlers. A test button is provided to check system operation. The cabinet contains a galvanized finish coat for protection. Additionally, the system comes with a five year warranty. 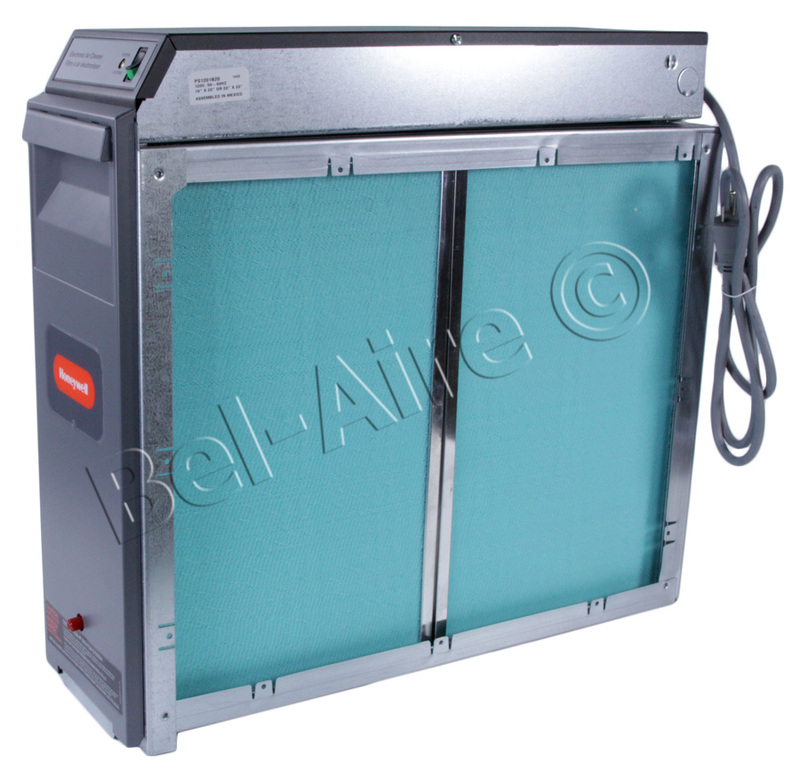 Permatron manufacturers the prefilters for the brand name electronic air cleaners. Permatron also manufactures a premium line of electrostatic prefilters and activated carbon filters. Permatron has engineered filter upgrades for the F50F & F300 utilizing the latest advancements in filtration technology. The best size air cleaner is the largest that will fit. 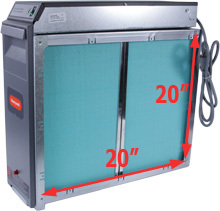 The larger the air cleaner, the greater capacity for particulate. This reduces the need to clean as often. The larger air cleaner will also have a slower air velocity that will increase the cleaning performance. Fitting the air cleaner to the current duct work can be a primary consideration. Not recommended is using a small F300 for a large house. The F300 are sized large, medium and small. The F300A2012 is an uncommon half size used in custom designs. The large F300E1035 (2000 cfm) are sized for a large house with a single large heating and or AC system. The F300E1019 F300E1027 (1400 cfm) fit a medium size house. The F300E1001 (1200 cfm) fit a condo or small house. Running the furnace-AC blower on constant is recommended. Most thermostats have an Auto-On switch. Setting the switch to ON will keep the blower running and purifying the air. The more dust collected by the air cleaner results in less dust on the furniture. The F300 has an air resistance similar to the standard 1" filter. Thus an F300 of the same size as the heating systems 1" filter is a good reference. Review the F300 installation instructions. The Honeywell F300 can be converted to operate on 240v/220v. Systems such as electric heat or AC may only have 240v available. The Honeywell warranty for the F300A2012, F300E1001, F300E1019, F300E1027, F300E1025 is 5 years. Our customers simply ship us the defective part. We test and confirm defective. We then ship back a brand new part at no charge.